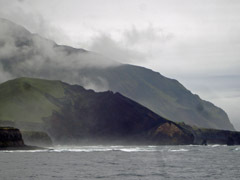 Report of the visit of the MV Island Sky to Tristan da Cunha during Christmas 2011. Passengers included 18 Association members. 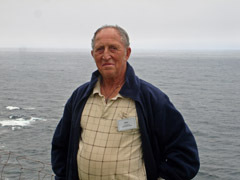 The Island Sky Captain Torbjörn Svensson is the son of the Swedish artist and writer Roland Svensson who joined Tristan Islanders on their return from volcanic exile in UK aboard Bornholm 1963 and later returned to Tristan, also later visiting Ascension and St Helena. 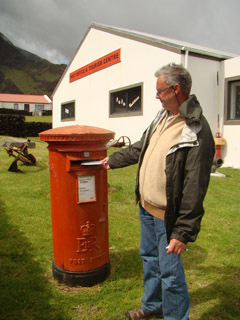 It was his father’s journey that inspired Torbjörn to put together the cruise itinerary and he came to the 2010 Tristan da Cunha Association Annual Gathering in Southampton to announce the special cruise 'To Tristan da Cunha and Beyond' it so that Tristan Association members, like those of the Roland Svensson Society, could book before it was more widely advertised. The 33 day passage went through 70 degrees of latitude and covered 7676 miles starting in the Cape Verde Islands and continuing via Ascension, St Helena, Tristan and the Falklands to Punta Arenas in Southern Chile. 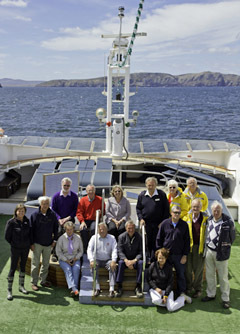 Of 93 passengers, 10 expedition staff and 65 crew members aboard, there were 18 Tristan Association members (including their partners) and 18 Swedes (many of whom were members of the Svensson Society). Uniquely the cruise offered the opportunity to spend Christmas with Islanders in their homes. 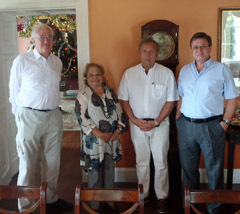 Tristan Association members in total. Island Sky approached Tristan as planned in the morning of 23rd December 2011. 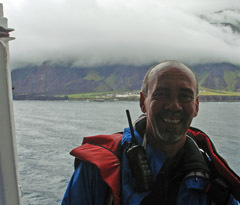 It was a gloomy morning with only a grey ribbon of land visible below a low cloud base, but good sea conditions so the ship was quickly boarded by an enthusiastic bunch led by Sean Burns and Ian Lavarello. 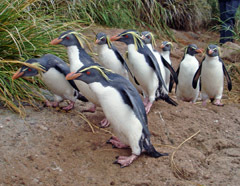 It was ‘a day’ for Nightingale, so Trevor Glass and his island guides took over and the Island Sky headed south-west to give passengers their first close encounter with a natural island full of wildlife. 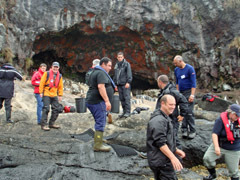 Photo centre from Guy Esparon shows passengers and Island Sky staff with Tristan Island guides disembarking at the rock landing, Nightingale Island. 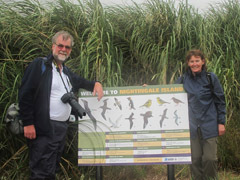 Right: Expedition staff members Mike and Sue Scott at the Nightingale species board. 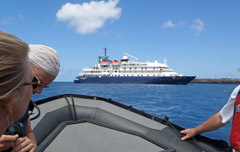 Sue has carried out many dives around the Tristan Islands and was joined for the first time by botany expert Mike to lecture aboard Island Sky. Photo from Sue Scott. 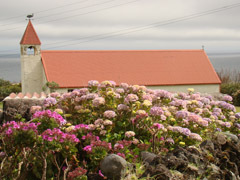 Right: A colourful hedgerow behind St Joseph's Catholic Church. Another first for the Island Sky cruise was a celebration event in St Mary's Church on Christmas Eve when passengers Peter and Debra Langley renewed their wedding vows in a service led by Tristan Lay preacher Eddie Rogers. 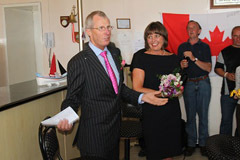 Peter and Debra were joined by a large group of well-wishers from the ship and Islanders, who joined the couple for a Reception afterwards in the Albatross Bar. 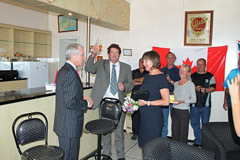 Photos from Peter Millington show; Left: Peter and Debra renewing their vows at the altar with Eddie Rogers: Centre Peter making his speech; Right: Administrator Sean Burns giving a toast, with Marina close by ready to present a cake. 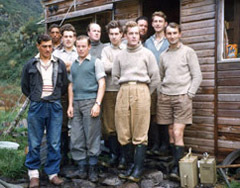 A good crowd gathered in the Prince Philip Hall later on Christmas Eve for an event presented by Richard Grundy firstly to show for the first time in public a film by James Hall of the Gough Island Scientific Survey 1955-56 which has been conserved and digitised by his widow Margaret. 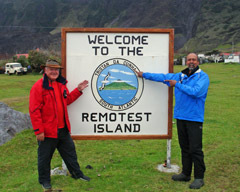 Two surviving guides to the expedition, Harold Green and Ernest Repetto, provided a commentary for the film made when they were 21 and 29 respectively. 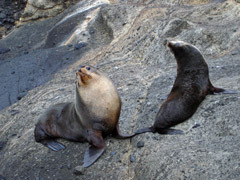 The scenes of Harold ‘riding’ a seal and Nigel Wace taking a bath in an oil-drum were two of the highlights. 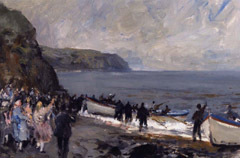 Later Richard presented, on behalf of the Tristan Association, three prints of paintings made by the artist Edward Seago (that are in Prince Philip’s private collection) made during the visit of HRH Prince Philip, Duke of Edinburgh, to Tristan in January 1957. In 2006 HRH kindly presented the prints to the Tristan Association. This cruise provided the opportunity to safely transport them to the island as they were delivered to the ship when calling at Portsmouth last September. They were received on behalf of the island community by Chief Islander Ian Lavarello, a gift from the Duke of Edinburgh presented in the Prince Philip Hall where he laid the foundation stone nearly 55 years ago. They will now hang in the Tristan Museum. 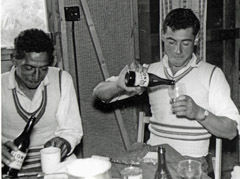 Ernest Repetto and Harold Green outside the expedition hut at The Glen in 1956. 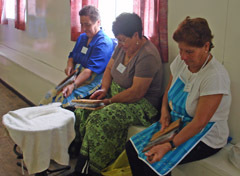 57 Island Sky passengers stayed overnight in Tristan homes or guest houses, 12 returning to meet old friends but most staying with Islanders for the first time and discovering the heart of this remarkable community focused on families and generous hospitality. They joined their hosts in hearty meals, milking their cows, in attending Church and got to know their extended families. Already some have joined the Tristan Association and hopefully may meet again at Association Annual Gatherings. 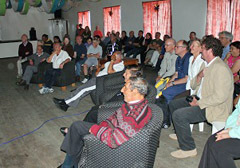 A packed programme had been organised by the Tourism Department led by Dawn Repetto. 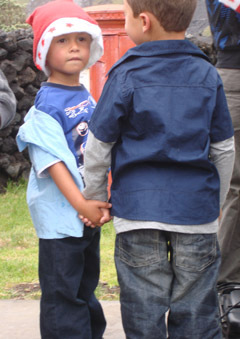 Walks or rides to The Patches, tours around the village, the 1961 volcano, the fishing factory and a Craft Day in Prince Philip Hall. Midnight Mass services at both St Mary's and St Joseph's Churches were packed with Islanders and guests staying overnight to share the celebrations, as was the Christmas morning service in St Mary's Church. The St Mary's School Christmas Concert on Christmas Eve was followed by carol singing at the Post Office and Tourism Centre with a visit from Father Christmas himself - see photos below. 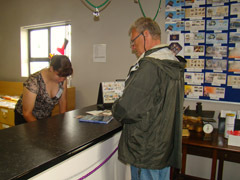 The Post Office and Tourism Centre provided a hub for passengers. From here all the tours departed, taxis could be arranged and guests could view the now extensive museum displays, purchase handicrafts and souvenirs, buy stamps and post cards or enjoy a drink or lobster sandwiches in the coffee shop. 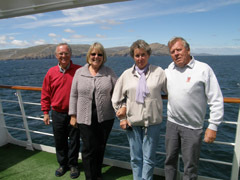 Photos from Ann Ashworth show: Left: Alan and Ann Ashworth with Jennifer and Ken Gardner. 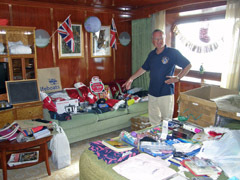 Both couples were returning to stay with Tristan families for the third time; Centre : Alan Ashworth sorting out Christmas presents for Islanders in his cabin; Right: Tristan hostesses, left to right: Iris Green, Judy Green and Judy's daughter Vanessa Lavarello. 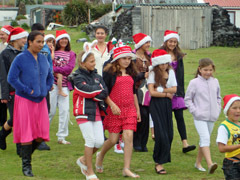 as Island Sky Passengers enjoy Christmas Day morning on Tristan da Cunha with their island hosts. Sadly opportunities for golf, football, fishing, a Boxing Night dance and a mountain hike were not taken up as the ship left more than a day early on Boxing Day. This was very disappointing for Islanders who had organised everything, and for passengers for whom Tristan was their main interest. Unfortunately sea conditions were difficult that morning as swells lifted the stern of this ship and huge applause rang out as the last people were safely loaded and Island Sky sailed away ‘Beyond Tristan’. 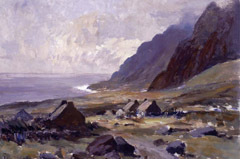 Left: The village; Centre: Guy still smiling; Right: Hillpiece and The Bluff emerge from the mist. 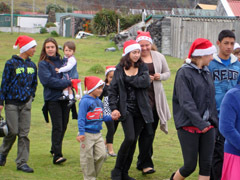 The three day Island sky visit showcased the professional organisation of the modern Tristan da Cunha Tourism Department staff led by its coordinator Dawn Repetto. 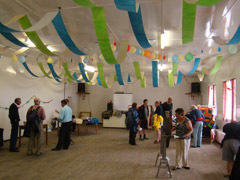 The full programme was excellent and guides were on hand should the weather have been suitable for a mountain walk. Passengers sceptical that a four days visit may be too long were very disappointed to be unable to take part in special events planned for the fourth day, including a dance. 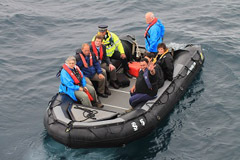 The Conservation Department led by Trevor Glass are to be congratulated for seizing the initiative and ensuring a successful visit to Nightingale Island went ahead when the sea conditions allowed a landing, ensuring passengers saw the penguins, albatross and seals. Zodiac drivers were impressed with the constant work of Stanley Swain and Jack Green in managing their entrances and exits from Calshot Harbour. 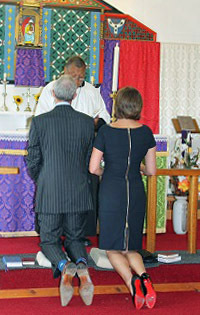 Lay Readers in both the Anglican and Catholic Churches should be given credit for welcoming guests at the busiest time of year, and for organising the vow renewal service for Association member Debra and her husband Peter. 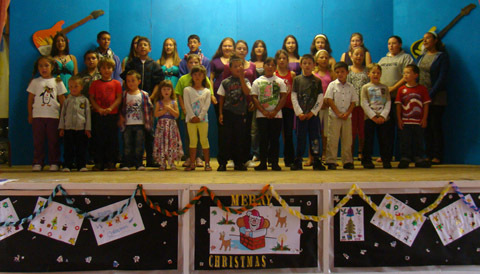 Guests appreciated the efforts of St Mary's School staff and pupils in giving up their time on both Christmas Eve and Christmas Day to provide a concert and sing carols. Special thanks to those who opened their homes and received overnight visitors, sharing their Christmas table and allowing passengers to share a Tristan Christmas. 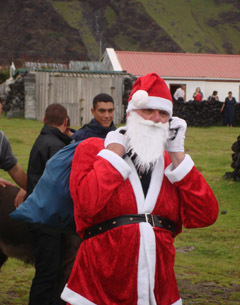 The sprit of Christmas is alive and well on Tristan da Cunha and after the Island Sky visit the Islanders reputation for generosity and hospitality has again been proved. When walking through the settlement we asked two persons, independent from each other, about the house where Roland Svensson stayed. We got the same answer from both of them. The direction was toward the volcano. When arriving to the house they pointed out for us we got uncertain. We saw a lady in a garden and we asked her, “is this the house where Roland Svensson lived”? 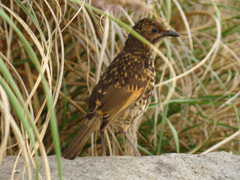 No she said, but he was often here visiting me. We continued to talk and then the lady invited us for tea. 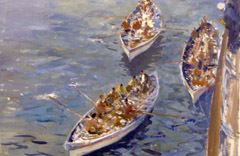 She could tell us that she went with Roland and other friends to Nightingale in a long boat. She was cooking for the men at Nightingale. She could also tell us that Roland stayed in a guest house somewhere between the Supermarket and harbour. The house does not exist any more. The lady we met was Catherine Glass. We got her address. We learnt that Lorraine is married to Andy Repetto who is a radio amateur. Bo is also a radio amateur and it would have been very nice to meet with Andy. 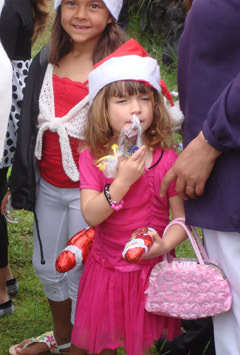 Catherine´s also talked about her daughter Sharon. 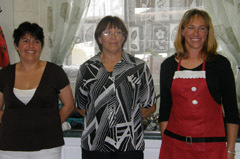 We met with Sharon in the school, we told her, “we have just visited your mother for a cup of tea”. We felt we wanted to do something as a thank you for the nice visit we had in Catherine´s house. Onboard the ship we had a box with Swedish ginger cookies. So the next day we went to the house again. No one was at home so we left the cookies inside the door together with a card saying “Thank You for the tea yesterday”. We thought this was the end of the story, but no. 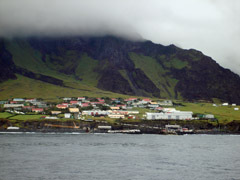 The next day the ship had to leave due to swell so there was no third day on the Island. To our surprise, we found a parcel outside our cabin. It was from Catherine, two pair of socks. White for Marie-Anne and brown for Bo, perfect in size. How the parcel came to the ship we still do not know. This little nice story will stay in our thoughts as long as we live. The story also shows how generous the Tristan people are. 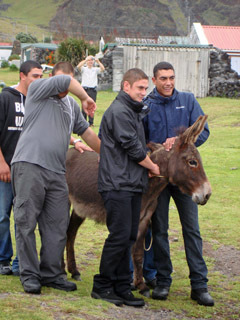 Our whole visit was a proof of that, all arrangements in the school, guides at Nightingale and guides following us to the Potato Patches as well as providing transport and many other things. Everyone we met stopped and talked to us. 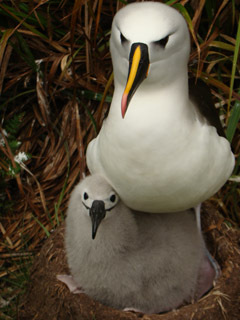 Editor's Note: Here is a reminder for those of us lucky enough to know Tristan well that you cannot be more generous to Tristan Islanders than they are to you. You may try, but they will only want to give you more. Many happy returns and thank you.